Home / News / Chiranjeevi's terrific look from Sye Raa goes viral! Chiranjeevi's terrific look from Sye Raa goes viral! some time now, and a long schedule has been shot in Georgia, where the war scenes were shot. Chiranjeevi's terrific look from Sye Raa goes viral on social media, where he is looking intense with his beard. 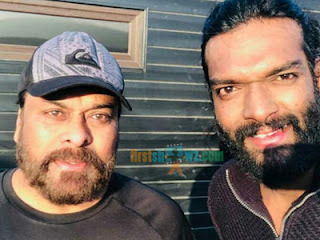 Actor Charan Deep posted a pic of the Chiranjeevi and him on social media and said that these are memorable events in his life, and that he is elated to share screen space with the Mega Star. The pics of Chiranjeevi's terrific look from Sye Raa went viral. Being made with a massive budget of 200 crores, 'Sye Raa Narasimha Reddy will have stunning war scenes. Hollywood fight masters are working for the film.